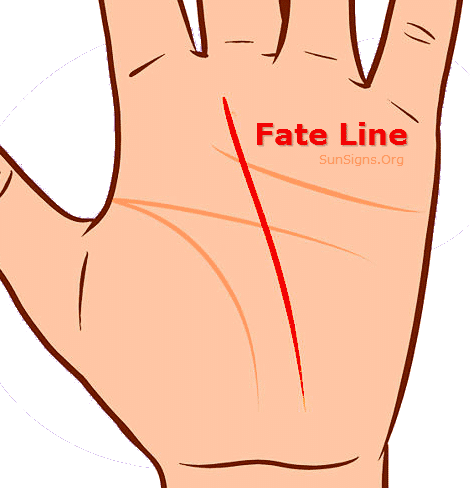 The final of the four basic lines of palmistry, the fate line is special in that not everybody has got one. It’s perhaps the most difficult to read line because of its frequent non-appearance, but it is nevertheless important in the reading of palms. The fate line can be hard to identify. Usually it is a line that runs vertically up from the wrist toward the fingers, but it can curve or be diagonal or even be hidden in with other lines on the palm! Some people don’t even have a fate line. That’s nothing terrible– in fact, it just means that your fate isn’t written solidly anywhere. If your fate line starts in the same place as your heart line, it means that your future will depend heavily on romance. It basically amplifies what your heart line says. If it crosses your head line, it means that you will be faced with decisions that are so radical, they change your entire life based on their outcomes. If it crosses your life line or runs into it, it means that you have unnaturally good luck. If your line somehow does not touch any of your other lines, it means that you have improbably high luck – not good luck, or bad luck, but simply some kind of luck all the time. If your line is deep and pronounced, it means that your life is already plotted out, and you are just turning the pages. If it’s shallow and feathery, it means that you hold the keys to your own life, and can twist and change your destiny very easily. If your line consists of several small lines, it means that you will have periods of both good and bad luck, but that they will eventually even out in the long run. A straight line indicates a steady influence of luck on your life, whereas a curved or wavy line indicates that only sometimes in your life will luck play a part, and that you must work hard in the times where it does not. There are plenty more aspects to palmistry than just these four lines, of course! The shape of your hands in general, the lines on your fingers, and the puffy bits under your knuckles (called “mounts”) all play parts in reading about a person, but a basic knowledge of these four lines will get you pretty far in palmistry. Now, go find a friend who will lend a hand, and practice!